Some days back I wrote about Kalamata Olives and how to brine them and I realized that I still have plenty of olives left from last year. There was no way I would let these homegrown gourmet in the cupboard any more. I decided that they should be consumed soon so right after posting for olives I decided to make olive bread. I also want to tell you that apart from me, the rest of the family is not a real fan of olives. The procedure is very easy and I didn’t need the mixer to make the dough. I kneaded it for about 10 minutes, until my hands were not sticky any more. I baked the bread around noon. The house smelled wonderful and I was really anxious to taste it. It was just right, crunchy outside, soft inside and the flavour was fantastic if you can imagine the taste of olives mingled with oregano and rosemary. The family was all at home and came to see what was smelling so nice. When they heard olive bread they were very disappointed. My husband and elder son without much enthusiasm tried a small piece at first and came back for more. I was begging my other son to try it and after insisting he tried a bit, taking out the olives and picking at me for putting olives in the bread and not baking a plain bread. He eventually came back for more and by lunch time the first loaf was gone. 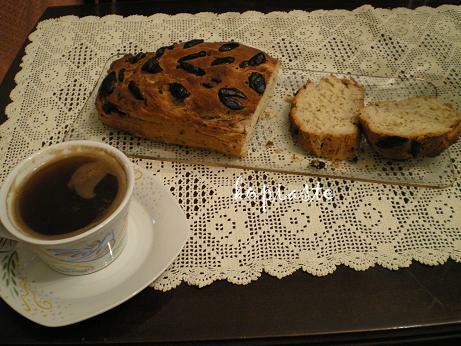 In the afternoon we had some of the second bread with our coffee and by the evening the other loaf disappeared as well. This is my entry for a Homegrown Gourmet: Quick bread event, hosted by Canela and Comino. In a bowl mix the flour with the dried yeast and the oregano, add the sugar, salt, olive oil and with your hands rub the flour with oil until absorbed. Slowly pour in the water and mix with your hands. Knead the dough without adding extra flour until it pulls away from the bowl and forms a smooth ball. Continue kneading until the dough is not sticky on your hands. Cover with a napkin and place in a warm place and allow to rise. Once this is done add the crushed rosemary and the olives and mix. Reserve 4 – 5 to place on top. Oil a loaf baking tin and place dough pressing and arranging it to spread and flatten. Brush with olive oil and put the olives on top. Preheat oven at 180 degrees centigrade and bake for about one hour. Ivy, olive bread is one of the more simple eating pleasures. I’m sure those loaves are already gone, my TV Star! Thanks Ivy for the recipe. Roberto LOVES olive bread and we get it whenever we see it at the bakery. How happy he is going to be when I make it at home!!! Peter you are right, and Jenn if I have managed to make my family eat it imagine how tasty it is, I am sure Roberto will be thrilled. Thanks so much for participating Ivy! Thanks for passing by Gretchen Noelle. Mmmmm… olive bread! Looks delicious! Mmmmm. Sounds so good and savory! I want to try this one. Hi Ann, thanks for visiting. Hi bbaking, thanks as well for visiting. Kalamata olives are my favorite, absolutely! I will definitely have to bake this bread. I can’t wait to have this bread. I have all the ingredients…now to find the time???? Hi Judy, thanks for stopping by. Good luck if you try it, but it’s so easy I am sure it will be a success.